USA Today is doing work for Barack Hussein Obama, today, trying to get the women’s vote for Obama by portraying him–through granny osmosis–as “breaking the glass ceiling” in the banking world. Yup, apparently, because “typical white person” Madelyn Dunham did that, Obama will now be the “first female” Prez. Oh, and “typical white person” granny was, apparently, a victim of racism, herself. But McPaper lets a few quotes from “racist” granny’s friend in, which don’t exactly back up B (Hussein) O’s claims about her. Plus, the Obama campaign is keeping “typical white” granny under wraps. Hmmm . . .
Durham, now 85 and living in Honolulu along with her granddaughter and Obama’s half-sister, Maya Soetoro-Ng, had two obstacles to overcome in Hawaii at the time – being a woman and being part of the state’s white minority. 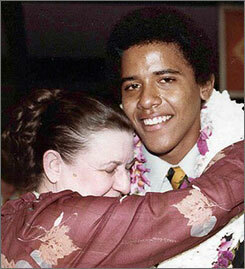 Obama and Soetoro-Ng lived with their grandparents Stanley and Madelyn Dunham, and later with their mother, Ann Dunham, in 1970s Honolulu, where white people were routinely the target of discrimination. “That’s the way it was,” Slom said. “Did people talk about race? We had local jokes ‚Ä¶ like that ‘pake’ (Chinese) guy or the ‘yobo’ (Korean) who did this or that. I certainly got my share of haole jokes.” . . .
Obama’s campaign declined to make Dunham available for interviews or to say whether the Illinois senator alerted her before delivering the speech. Dunham has repeatedly declined to comment to reporters, and Soetoro-Ng declined to comment on Obama’s speech about Wright or their grandmother’s attitudes on race. Others who know Dunham were caught off guard by that mention in Obama’s speech. ” I never heard Madelyn say anything disparaging about people of African ancestry or Asian ancestry or anybody’s ancestry,” Slom said. It sounds like there has been a lot of “revisionism” in the portrayal of “Typical White Person” granny. And far too little mention of anti-White racism of the type she faced, versus what she’s accused of by her ungrateful, spoiled grandson. Revisionism? Or maybe your purposeful attempts to take his remarks completely out of context don’t stand up in the face of actual reality. See, if he never actually called her a racist or intended “typical white person” in the way you’re using it(that is, out of context as a smear), then nothing in that sounds off at all. The only racism I have personally observed in my many years on this earth is the anti-white version. Obama’s spoiled now, too? Did you throw that one in just for good measure? Keep up the smear job, Debbie. Once again, nothing you’ve written here about Obama is rooted in fact. BO’s an excellent user of people as stepping stones to obtain what he wants. He’s definitly lacking in forthrightness and fits well into the federal kleptocracy. This should bode well for him in the upcoming election. Combine these with his democratic penchant for pretended class warfare and he’ll be a shoo-in for the Presidency. Just what we need–another economically illiterate populist! Racism is everywhere – against Blacks, Whites, Jews, Catholics, Asians, Europeans, Arabs, Muslims and Hispanics. People are more comfortable being around other people who are like them. And everyone loves a good scapegoat. Dontcha just wanta hug that rascally Balack Hussein Obomba? Say what you will, he’s just another racist JAMF along the same lines as Al “Not-so-Sharpton” and Jesse “Can’t keep it in my Pants” Jackson. Only difference is he’s a bit smoother in how he goes about it. B.O. has a glaring problem with his campaign. How to win over the TYPICAL angry white males that have been and continue to be prejudiced against because of their skin color. Not so Affirmative Action is still being felt in the work place and the consequences will continue to be felt as long as the incompetent minorities that were given unfair advantage for too long occupy jobs that they don’t deserve and use to advance other minorities. Like administrative jobs in management where they can harass non minority employees with out fear of reprisals. Like the taliban they operate within certain boundaries where they are safe and can reek havoc on actual PRODUCTIVE and honorable employees. B.O. can forget about the angry white males. We are a different animal from the guilty white lib. We see through the b.s. because of real life experience and knowledge of statistics. Another thing. We aren’t afraid of people who are different from us. Suspicious, yes. Afraid no. Ah yes, the poor downtrodden white male. It’s terrible isn’t it? You NEVER see white males in senior management positions, You NEVER see them on T.V. or in the media – it’s as if they don’t exist! It’s awful the way society treats white men as second-class citizens, that’s why they do so badly in education and why their average income lags so far behind women and African-American males. Perhaps one day white males will throw off the shackles of oppression, burn their baseball caps and pizza boxes, and rise up and take it to the man. She is also the woman who paid for his Education at Punahou and college. (a) I’ve visited Hawaii only once, but I have no trouble believing that their #1 distinction is “Hawaiian” (of any race) vs. “mainlander” (of any race). (b) I remember being in grad school in the USA when the whole “affirmative action” business became hot. One “Afro-American” activist had the brutal frankness to tell me (she had no idea I am Jewish): “without it, all the good jobs in academia will go to Jews and Asians”. (c) Who was it again (Jackie Mason?) that made this point: if all the liberal guilt artists who peddle the reverse racism, excuse me, “affirmative action” agenda were serious, they’d all resign from their top positions and recommend blacks and Hispanics as their successor. 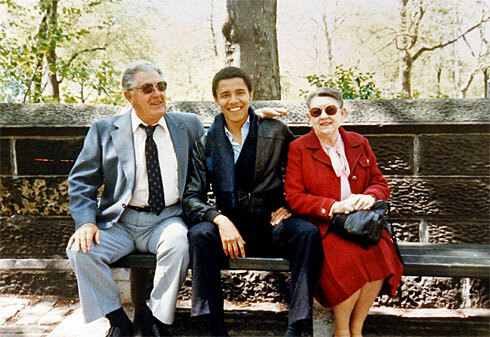 This photo “B (Hussein) O’s “Typical White Person” Grandparents” is a lie! There is no love lost among them. If you’d look at the hand of the granpa over the shoulder, you’ll see it’s NOT touching Obama. And th pic of the grannie hugging Obama, doesn’t seem to be reciprocated.